Killearn Village Hall provides a beautiful blank canvas for creative couples looking to design a completely unique wedding day. Set against the breathtaking backdrop of the Endrick Valley with stunning views across to Loch Lomond and the Arrochar Hills, Killearn Village Hall truly provides a picture perfect location for your big day, just 25 minutes from Glasgow! If you choose to hold your wedding at Killearn Village hall you will have the best of both worlds – the freedom to completely personalise the look and feel of your day, with the back up of our our experienced wedding team, to assist with the co-ordination on the day to ensure everything runs smoothly and to schedule. The original stone village hall building has recently undergone a multi million pound renovation, incorporating a stunning, architect designed glass extension. 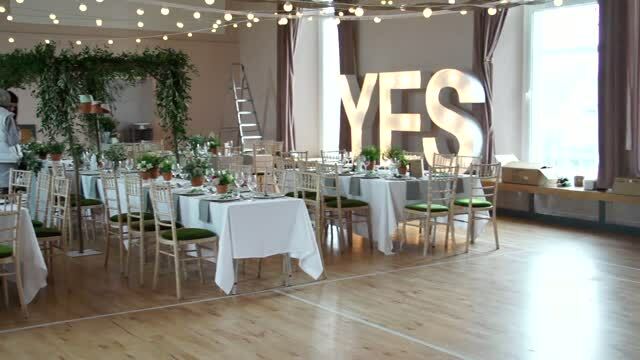 The venue now houses multiple function spaces under one roof; the ‘Garden Room’ reception lounge which opens on to the grassy Glebe; the Three Sisters Bake café bar and balcony with views across to Loch Lomond which hosts your evening bar and break out area, and the main hall itself, where your ceremony, dinner and, of course, dancing and merriment will take place! We can accommodate humanist or civil ceremonies onsite in the main hall, alternatively, the village hall is situated just next door to the beautiful Killearn Kirk. Killearn village is a close-knit community and offers a variety of local wedding services including accommodation, floristry and styling. Visit the Useful Links page to find out more.